Black Balsam Knob is a tree-less bald that sits above 6214 ft. in elevation and gives wide sweeping views of surrounding mountain ranges. There are several trails accessible from this point on the Blue Ridge Parkway and plenty of areas to explore. A great short hike for families, day hikers, picnickers, photographers, and those looking to summit surrounding peaks. This section of trails includes some of the most spectacular mountains and balds in the Southern Appalachians, including Black Balsam Knob, Sam Knob, and Tennent Mountain. 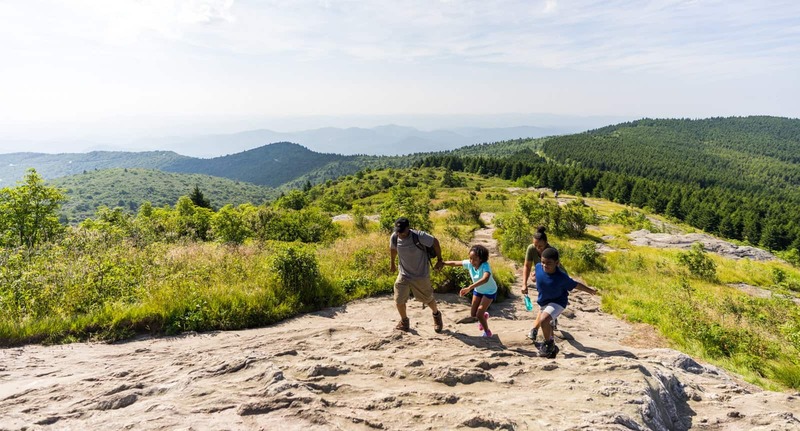 You can extend your hike by hopping on the Art Loeb Trail which runs over Black Balsam Knob and leads to some good connecting trails for a loop hike. 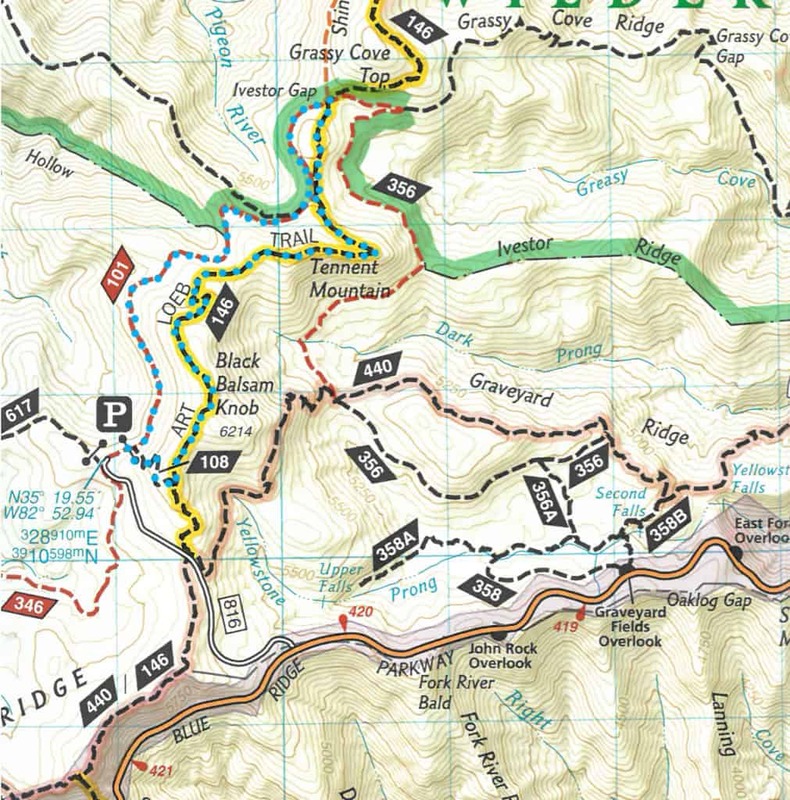 To see hiking trails in the area purchase a Pisgah Ranger District Map at our Visitor Center or your local outdoor retailer to make loop hikes. Below we’ve suggested a 5 mile loop to get your started. This trail is not available year round due to the Blue Ridge Parkway closing in the Winter and in icy conditions. Follow the light blue dots on the map below. Instead of parking at the Art Loeb Trail for Black Balsam continue driving to the Shining Rock Parking Area. From Parking take the Art Loeb Spur on the right side of the trailhead to meet the Art Loeb trail and take a left for Black Balsam knob. Continue on the trail marked by white blazes to Tennent Mountain and on to Ivestor Gap. You will come to a large intersection, take the trail sharp left, Ivestor Gap will lead you back to the Shining Rock Parking Area. There are campsites sheltered from the wind closer to the parking lot by the trailhead but if the wind doesn’t bother you, anywhere on Black Balsam Knob is free game. If you choose to camp farther away from Black Balsam in the Shining Rock Wilderness you are not allow to have campfires so remember to bring a camp stove and leave no trace! Also remember it can be 20 degrees cooler on the summit than down in the valley so pack appropriate layers. Head up Highway 276 to hop on the Blue Ridge Parkway. Go South and just past milepost 420, look for the road to Black Balsam on the right. Parking is available on the side of the road.